For the first time ever, Anita Goodesign introduces its new AA size for a 9.5" x 14" hoop! 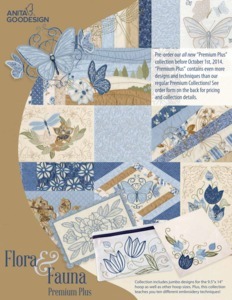 The Flora and Fauna Premium Plus collection provides you with a 104 page tutorial booklet, teaching ten different embroidery techniques, with all designs now including the 9.5" x 14" jumbo size. This Premium Plus collection contains 20 appliqué designs with multiple sizes and that's nowhere near the end! From lace edge centerpieces, zippered bags, landscapes, and folded fabric, this collection will certainly keep you entertained creating new projects from home decor to accessories. Each of the quilting blocks come in multiple sizes as well so every quilt design in this collection is fully compatible with our Mix and Match quilting line. designs, cutwork blocks, free motion, and shadow work trapunto, and landscape designs just to name a few. • There are even project designs so you can embroider lace edge centerpieces, zippered bags and tablecloth corners. Mix & Match, Quilting Essentials & Beautiful Blocks & Borders Collections. Tablecloth Corners (9”x9” / 10 designs, 3 sizes ea.